Even though we have a dishwasher in our kitchen, I always keep a couple of sponges under the sink because the standard kitchen sponge can do much more than just wash your dishes! Here are some super creative ways to use sponges that will have you running to the store to buy more! Use a sponge to make simple ice pack for treating swelling and bruising. 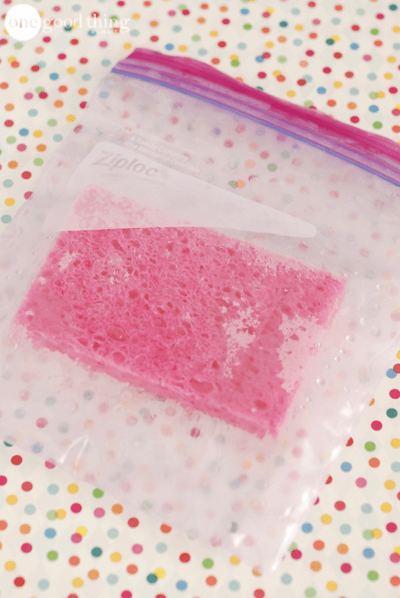 Soak a sponge in water, place it in a sealed plastic sandwich bag and freeze until solid. As the sponge thaws, the water will stay sealed up in the bag without getting all over. Sprinkle a damp (not wet) sponge with baking soda and place it in your fridge. It will absorb odors, and you’ll able to stretch a box of baking soda over a longer period of time. Tape or rubber band a sponge to the end of a chopstick to clean and dry narrow vases and containers. You can use a couple of sponges as kneepads when scrubbing floors, gardening, or doing repairs. Attach small pieces of sponges to the bottom of your decor, furniture legs, or on picture frame stands. The sponge pieces will prevent scratching when these items are moved around. Protect your hands when shoveling or raking by wrapping a sponge or two around the handle. Secure the sponges with a couple of rubber bands. Before planting a flower in a pot, cut a piece of sponge to fit snugly in the bottom of the pot. The sponge will soak up water and help keep the roots of your plant moist! Cut up a sponge into small squares to use as “toe-separators” for at-home pedicures. If you’re planning on sending a big batch of letters at once (like “Thank You” notes, invitations, etc. ), save your tongue by using a damp sponge to moisten the envelope seals. You can use a damp sponge to sprout seeds! Select fast-growing seeds like flax, radish, watercress, alfalfa, or mustard. Place your seeds on a damp sponge and place the sponge on a plate. Cover the plate with an upturned glass bowl and place in a sunny spot. When the seedlings have sprouted, you can either enjoy the sprouts as is, or transfer them to a pot to grow! Use the scrubbing side of a kitchen sponge to remove pills from sweaters or furnitures. Bonus Tip: Quickly get rid of pet hair of lint on your clothes by using a damp sponge to swipe them away. Use a sponge to make a nail polish remover jar. It’s the easiest and cleanest way to remove your nail polish! (Get all the details and instructions for making a nail polish remover jar. Cut a few different colored sponges into smaller strips to make safe and and quiet building blocks for your little ones. Place your bar soap on top of a sponge in between uses. It will allow the soap to dry out quickly, minimizing the mess and making your soap last longer! Thanks for the cool ideas. As a teacher glue sponges are really great! The Jenga idea is really cute:) Sort of a Nerf version. Wow!!! Amazing tips. I never thought that sponge can be used as like these. I will try your sponge with baking soda in my fridge now itself. I hate my fridge’s smell. Hope it will absorb it’s odors. You can cut up old used sponges and combine with potting soil or compost to retain water in pot plants or in garden plants. Awesome ideas I never thought about with kitchen sponges. GREAT TIPS. NEVER THOUGHT OF SOME OF THOSE. How do you get your toes in the nail polish remover jar?? You don’t. But you can cut a small piece of sponge to use as your “cotton ball.” It lasts longer, produces less waste, and can be stuffed and stored in the jar with the rest of your polish remover.